Earlier this month, we showed a space-based view of a glory—a colorful, circular optical phenomenon caused by water droplets scattering light. The Moderate Resolution Imaging Spectroradiometer on the Terra and Aqua satellites can see only a cross section of the glory, making it appear in satellite imagery as two elongated bands parallel to the path of the satellite. To the Earth-bound observer, however, glories take on a circular shape. You might have seen one while on an aircraft. From this perspective, passengers on the side of the plane directly opposite the Sun can sometimes see the plane’s shadow on the clouds below. This position is also where glories can be observed as the cloud’s water droplets scatter sunlight back toward a source of light. 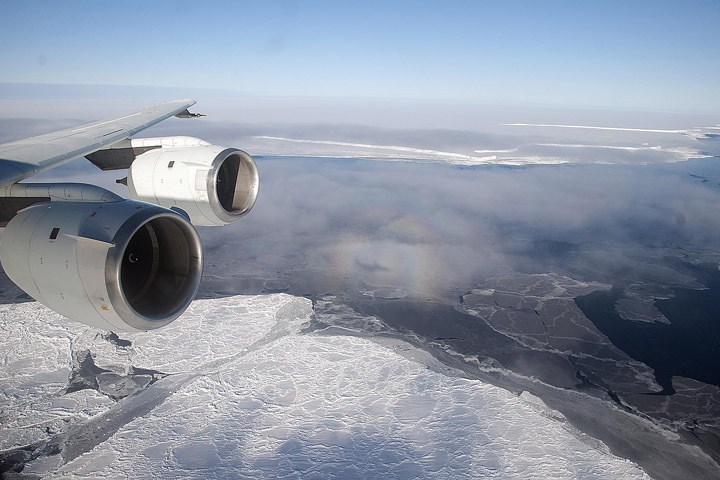 But you still have to be flying close enough to the cloud deck for the phenomenon to be visible, which is one of the reasons why they are frequently spotted by scientists and crew with NASA’s Operation IceBridge mission. The mission makes annual flights over Earth’s poles to map the ice; flights are relatively low, long, and frequent. Glories are not part of the mission’s science goals—in fact, clouds can interfere with the collection of science data. But they are on the list of natural wonders that IceBridge scientists witness in the field. 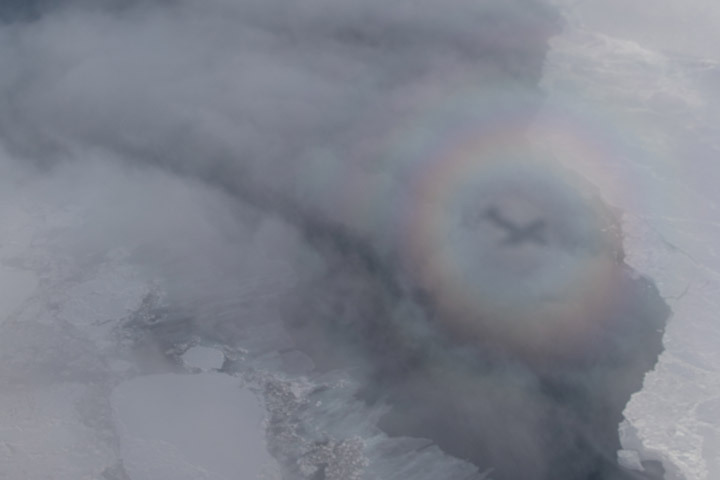 One such Antarctic glory is visible in the image above, snapped by Michael Studinger during an IceBridge flight on October 26, 2010. Read more about that image here. This entry was posted on Monday, July 9th, 2018 at 12:04 pm and is filed under Image Highlight. You can follow any responses to this entry through the RSS 2.0 feed. You can skip to the end and leave a response. Pinging is currently not allowed.